With the creation of the Weston Village District, we believe there to be a natural answer to mitigating the concerns about rising taxes, school budget cuts or a lack of services. It is a solution that we can use to maintain the things that we love about our town while permitting it to grow simultaneously. But as stated before, the creation of the district is just the beginning. It will be incumbent upon those who care to become involved in helping to shape it. And to that end, we rely on the input of diverse opinions, backgrounds and talents to involve themselves in working cooperatively. The Village District’s impact on our culture should be to improve what’s best about our town, while addressing outstanding needs. No one is interested in seeing Weston become cluttered with strip malls – on that, we all agree. But using the district plan to enable P&Z to designate commercial areas within the very narrowly defined area makes sense. This is a process that, necessarily, should be inclusive, welcoming and empowering. What is the Weston Village District Coalition? 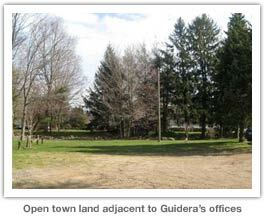 It is an effort of Westonites to propose using The Village Districts Act of 1998 to designate a small and distinct area of town and define it as our "village district." Within this district, all local government, religious, residential and commercial buildings, structures and properties would be multi-zoned, empowering Planning and Zoning with narrowly-tailored parameters in which to both protect our unique character, while guiding our growth and maturation. What is the Coalition’s vision for preserving the look-and-feel? If one were to define the architecture of Weston’s current downtown area, you would likely say the Georgian (Weston Center) or Federal (George Guidera’s office or the Military Academy) styles. Any commercial development should probably stay within those genres. What specific sites within the district could be viable commercial space? 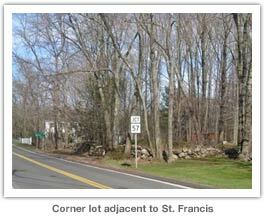 Some of the more apparent locations include the town-owned land across from Weston Center (between the Onion Barn and Bus Depot), Guidera’s Office and the Military Academy, the residential homes along Norfield Road adjacent to Weston Center, and the single residential home, excess land and side driveway parcel of St. Francis. Wouldn’t any commercial development require sewer installation? No. Solutions exist that can address most business needs. There will be some types of businesses that our lack of sewer would impede, but the vast majority would be fine. How does the plan address sidewalks? In two ways: first, the town engineer recently explained that we received funding for sidewalk installation. Perhaps instead of concrete, we could use red brick pavers – which could be supplemented by individuals, families and businesses underwriting naming bricks. The Westport Public Library utilized a similar method very effectively. Second, we propose approaching arborists and partnering with them to allow dumping of endemic/local wood chips along a specific path, which would create a hiking, jogging or fitness trail in an environmentally responsible manner. This would help link the schools to town and could remain a solution with other fitness uses even after more proper sidewalks are installed. Lastly, we would leverage the village district to empower P&Z to require developers to install new sidewalks (with appropriate plantings) along the appropriate boarder(s) of their lot whenever they’re building. Wilton, very effectively, did something along these lines. Will the Village District plan increase tax revenue? Yes. 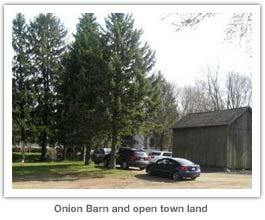 And it could do so in several different manners: using some of the proposed development sites, above, the Town could land lease the parcel between the Bus Depot and Onion Barn, which would create new stable rental income for long periods of time. 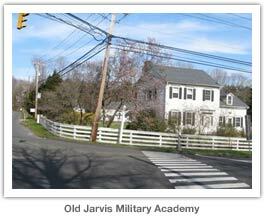 Additionally, the Military Academy could be rented or sold. The other two parcels (residential homes along Norfield and residential home and excess space at St. Francis) would provide on-going commercial tax income. What about residential home owners who live inside the district? They would be under no obligation to do anything differently than they do now. In fact, their property values would likely increase as a result. If and when they chose to sell and capitalize on their good fortune would be entirely up to them. How would our religious, government and school buildings be impacted by the plan? Like residential homeowners, each of those groups have self-determination over the future of their assets, this plan doesn’t change that. 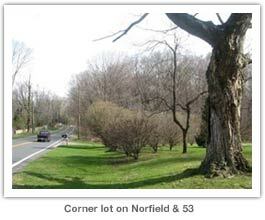 We could easily see Norfield Congregational Church being interested in selling the residential home on the corner of Weston Road and Norfield and St. Francis being curious about their side driveway parcel’s value. The schools have their own plan, which the added income may help with. And the government buildings too could benefit from the extra income. What about the Coalition’s recommendation for easing traffic? We’d like to see the current Bus Depot relocated to the Department of Public Works site Old Hyde Road and immediately behind and adjacent to the Weston Middle School. Doing so will alleviate the traffic in the downtown area and re-distribute the congestion so that there are several points of egress for busses (two ends of School Road and multiple points from Old Hyde Road). The Town will also then have the old bus depot space and strip along Weston Road available. Who are the WVDC spokespeople? We’ve avoided having any one public face, frankly. It just felt as though this should be an inclusive process, now and going forward. Having any one person be in the spotlight would distract from the spotlight being on the plan itself. The Weston Village District Coalition was formed by like-minded concerned Westonites who believe there’s a common ground solution between the folks concerned about rising taxes and those concerned with firing teachers and cutting school budgets. This plan addresses those, and many other, vocalized needs. What’s next for the Coalition? How do I get involved? Our goal was to set in motion a plan, provide the Town, P&Z and other departments with a map (literally, there were no maps of our downtown area prior) and get the discussion started. Once that has taken place, we intend to dissolve the coalition and, as individuals, join related committees, working groups and meetings to tackle the work necessary to building our future together. To that end, we’d encourage anyone inspired to get involved in a similar manner. Only together are we going to overcome challenges and take advantages of new opportunities.